If you set out to read Brian Massumi’s book Semblance and Event. Activist Philosophy and the Occurrent Arts after having read about ‘activist philosophy’, ‘occurrent arts’, ‘interactive art’ and ‘art intervention’ in the book’s title and on the back cover, you may find that you have to adjust your expectations. This is not a book about the event in explicit manifestations of activism or (inter)activity, whether philosophical or artistic. Rather, it engages with an analysis of process, activity, change, as in the event of experience that certain interactive, as much as traditional ‘static’ works of art may produce, all of which can be considered ‘occurrent arts’. This is where ‘semblance’ comes into play. The term can be found in Walter Benjamin and Susanne Langer. Benjamin used the term semblance (Schein) both for something that appears visually, but without really existing and for something that does not appear visually, but yet is conceived in the visual realm. He related semblance to the aura of anything that is beautiful, and that through the experience of its beauty relates to truth. (pp. 175–180) ‘Semblance’ is also found in Langer’s theories of perceptual movement in art (pp. 41, 43). For instance, when one sees motifs of spiraling leaves, one sees movement, even though an image is supposed to be just static form. Accordingly, when looking at objects one simultaneously perceives something of their texture, weight, volume or other physical qualities. Just looking at images or objects makes it possible for the body to experience them synaesthetically, though without really sensing them. All this is virtual experience, pure potential, an event of experiencing lived abstraction. And this is also where its strength lies, in being purely potential. It is in that which comes in the event, what this virtual experience of lived abstraction is composed-with, what is composed-out and how this occurs, that the potentiality of change in process lies, and so also the politicality of the process. In art the question of what ‘dose of the world’s surrounding “general activity”’ will be composed-in, -out and how it can be determined by the artist in a work of art. One can argue that Massumi’ ideas about the political in art being a matter of form rather than content is not a groundbreaking innovation. One could also be skeptical about Massumi’s examples: for instance Gustav Mahler’s music and Robert Irwin’s art in the closing chapter exemplify too perfectly the theory of the event-value of art’s experience as lived abstraction. (pp. 53–54) Should activist philosophy be so detached from reality? In response, one could think of the above arguments in reverse. Not so much to find counterarguments, but directions through which the book opens up to its own points of departure. 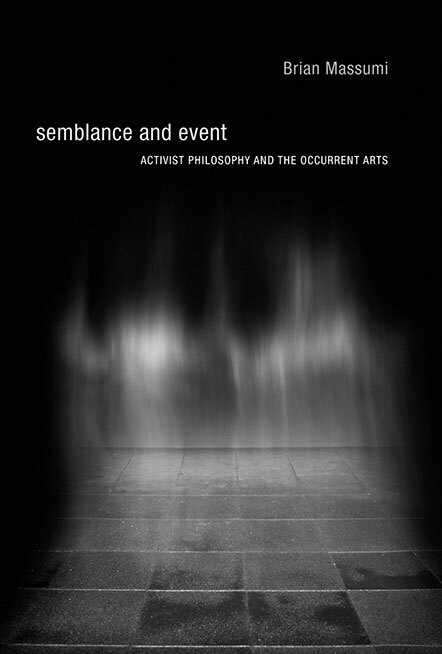 Indeed, Semblance and Event seems to return to areas of formalist approaches to art. Approaches that since the 1970s have been heavily criticized and even held in contempt by critical art theorists as too ‘aesthetic’, elitist, apolitical, indifferent to cultural and social diversity of viewing subjects and even producing passive viewers. I think that Massumi’s approach shows where the baby was thrown away with the bathwater, by reminding us that ‘static’ form does not exist, by exploring the rich spectrum of activity among body, thought and imagination that is potentially capacitated by ‘just’ looking at images, ‘just’ experiencing lived abstraction, and by distinguishing between the interactive function and event-value of works of art. The emphasis on the nonsensuous brings back the question of detachment from reality, activism’s sensitive spot. But what does it actually mean to be detached from reality when the experience and perception of reality itself has its detached side, the experience of semblance, the nonsensuous comprehension of things. The radical perfection of Irwin’s example shows how works of art have the capacity of making perceptible this duplicity of perception. As a clinically perfect case study for the lived abstraction of perceiving perception, the example’s generic character seems in tune with the book’s central concern and ambition: art and philosophy in Semblance and Event operate as theoretical toolkits rather than instruction manuals for understanding the politicality of process in creation and perception – leaving it to the book’s reception to show the tools’ use value. Eva Fotiadi is Lecturer in Contemporary Art and Theory at the University of Amsterdam and the Gerrit Rietveld Academy of Arts. In 2011, her book The Game of Participation in Art and the Public Sphere was published.